China, Japan, and South Korea held a long-awaited trilateral summit this weekend, their first in three years. Premier Li Keqiang attended on behalf of China; he also took the opportunity of attending the summit in Seoul to pay his first official visit to South Korea from October 31 to November 2. In addition to South Korean President Park Geun-hye, Li met with Prime Minister Hwang Kyo-ahn and Speaker of the National Assembly Chung Ui-hwa. After the trilateral summit, Li held a separate bilateral meeting with Japanese Prime Minister Shinzo Abe. Even when emphasizing the cultural and social ties between China and South Korea, Li managed to bring up economics. He praised South Korea’s traditional dishes of kimchi and ginseng chicken soup, and promised to make it easier for Seoul to export such food items to China. The two sides also agreed to work toward ratifying their bilateral free trade agreement, which was signed earlier this year. During talks with Park, Li focused most on how the two governments can cooperate to boost innovation and entrepreneurship in both China and South Korea. Innovation is a key part of China’s long-term economic plan, and Beijing is seeking help from every possible source in trying to transition from the “world’s factory” to being a globally-recognized source of innovation and creativity. According to Xinhua, Li called the decision to cooperate on national innovation strategies an “important achievement” of his visit to South Korea. The two sides plan to set up a joint “innovation park” in the Chinese city of Chengdu and will encourage innovation cooperation between Chinese and Korean companies. South Korea and China also agreed to speed up industrial development in central and western China, a key part of China’s “One Belt, One Road” vision. The two countries will discuss cooperation on investing in third-party countries as well, which could potentially see South Korea play a joint role in some of the investments being made along the planned “belt and road,” whether in Southeast or Central Asia. In addition to economic cooperation, the two sides also discussed the situation on the Korean Peninsula, including a reaffirmed commitment to denuclearization. “We will work in concert with all relevant parties to ensure that there won’t be a U-turn in the process of lowering tensions on the Peninsula, and press ahead with denuclearization,” a Chinese foreign ministry spokesperson said on Monday. China-Japan relations are slowly recovering from a chill from 2012-late 2014, sparked by the two countries’ competing territorial claims over the Senkaku/Diaoyu Islands and exacerbated by what China sees as the Abe administrations’ unrepentant stance on historical issues. In his discussion with Abe, Li said the two countries must “properly handle” these sensitive issues, and not allow them to derail the overall bilateral relationship. Li reemphasized China’s admonishment for Japan to face history squarely, though he also praised the current positive trends in China-Japan relations. Though the content of the talks was being kept close to the vest, unnamed “government sources” told the Yomiuri Shimbin that Abe planned to raise his concerns over Chinese development of natural gas fields in the East China Sea, as well as Japan’s displeasure with Chinese government vessels conducting patrols near the Senkaku Islands. 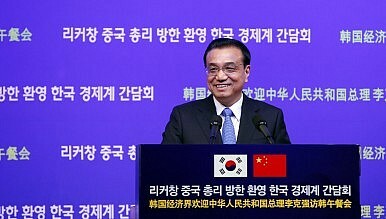 Li Keqiang (not Xi Jinping) will represent China at the upcoming China-Japan-South Korea trilateral.